If you have been stopped by the NH police and are suspected of Driving under the influence or DUI, the officer will most likely administer 3 Standardized Field Sobriety Tests: the Horizontal Gaze Nystagmus, the Walk and Turn, and the One Leg Stand test. The most scientific of them is the Horizontal Gaze Nystagmus (“HGN”) test, which measures nystagmus – the involuntary jerking and twitching of the eyeballs. The theory behind the test is that Nystagmus becomes pronounced when a person is under the influence of alcohol and/or drugs. The National Highway Traffic Safety Administration conducted a study which opines that if a subject exhibits HGN, there is a probability that their blood alcohol content is a 0.10 or greater, enough to get you arrested for DUI. The above referenced types of nystagmus are obtained from Dr. L. F. Dell’Osso, Nystagmus, Saccadic Intrusions/Oscillations and Oscillopsia, 3 Current Neuro-Opthamology 147 (1989). There are many factors that can cause horizontal nystagmus other than alcohol consumption; diet, disease, exposure to solvents or dry-cleaning chemicals, prescription drugs and/or antihistamines are just a few. If you test positive for HGN you will want someone trained and experienced at your side in the courtroom. 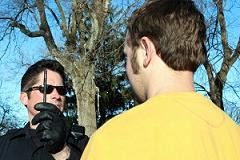 The DUI lawyers at Tenn And Tenn, PA in Manchester, NH are experienced in the administration and interpretation of the HGN test, as part of their Standardized Field Sobriety Test training. If you are facing a DUI in New Hampshire, contact our lawyers right now for a free consultation. We can be reached on our DUI Helpline at 1-888-511-1010.